I do love these races! You notice quickly how friendly and “Grass Roots” they are. There is excitement with competitiveness, but a sincere friendliness. The locations are often laid out in a such a manner, that people sit together and actually have conversations. Strangers meet and become friends, and people from the last race remember your name. But despite being Grass Roots, the prizes are really great and most people come away with something pretty cool. However; There is also nothing Grass Roots about the competition field, once that “Go” command is yelled…all hell breaks loose and jockeying for position begins. Todays race was no exception. As I pulled up, Derek and Marco were busy hanging the Cliff Bar sign up. Cliff Bar is also sponsor for the Dion Snowshoe series now. No surprise a big name wants in! Derek I might add, is not even home a week after competing in the Yukon Ultra 100 miler last weekend! I am in awe of this feat, it’s my hope to complete a 100 miler in the next year to year and half, but to do one in the Yukon is beyond my comprehension right now. ( Although…it has me curious ). Anyway, The race was located at the Westbrooke golf course just past Kingston. Very easy to get to, and the location is ideal. After doing a nice little tour ( about 1K ) on the course itself, it hasus run up and into the Woods to the local trail section. This is beautiful and amazing, and even as you run ( with a HR at 90% ), you cannot help but realise that heaven is not as far as you might think. With the biggest snow storm of 2013 only 1 day behind us, I was not sure if I was actually going to make it. But as promised, the snow stopped overnight Friday and the sun came out in the morning. With the Plows clearing the roads, it was smooth sailing all the way to Kingston. I would estimate that we had about 20 – 30 cm of fresh, fluffy, soft snow to race in. The trails has been packed by Derek, but the snow was loose and the best way to describe was “slippery” even with snowshoes. Temperature was probably around – 10 with a slight NW or NE wind, it was hard to tell which way..but the sun was bright and very warm. To sum it up: PERFECT! 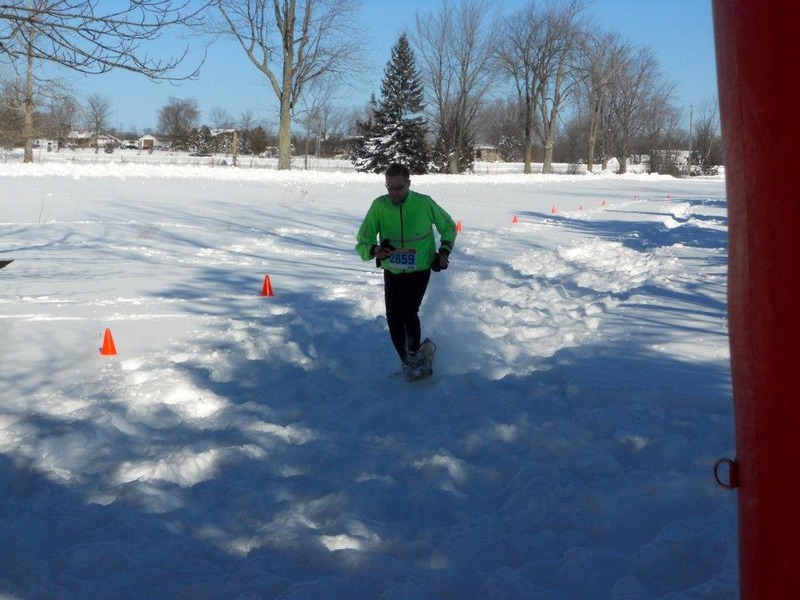 The course had been shortened because of the snow fall to 6KM. We started at the golf course and went out and around for about a 1 KM, before we climbed a hill that lead into the Wooded trail section. The start of the race was the usual cluster and sprint for position. Some go out too fast ( I have in the past ), others too slow ( I have in the past ) and others just hoping to land somewhere close to their ability ( pretty much my race strategy ). It was clear right away, that this was not going to be a Frontenac. We were working very hard for our pace and it was going to be a job. No 5:00 min / km this time. I settled into 3rd position behind and Joe Turner and Keith Iskiw and continued to push forward. All I could think about as we moved through the snow was the Title of the Ultramarathon book “ Relentless Forward Progress”. That was the type of race it was without a doubt. Keith, Joe and I stayed grouped up as we ran through the woods. We entered the “Lollipop” portion of the field and it got deep and hard very quickly. We each took turns leading for a few minutes and then falling back to take a bit of a break. It was my first real experience doing this while running and it was great. I can’t speak for Keith or Joe, but placement at that point was not a real concern. I pretty much knew it would sort itself out once we got back into the woods. Finally we broke the loop of the field and started climbing back into the forest. Quickly, we picked up our pace again and spread out. This time, the gap stayed true and Keith really turned it up a notch. Our positions settled and I was pretty content. Keith – 1st, Joe – 2nd and myself 3rd. Coming back in, the trail was broken but still slippery and I still could not get any forward spring. As we came down the hill and back onto the Golf Course, it was a quick run back in. I could see both Keith and Joe in front and I knew bridging the gap was not going to happen. My HR was already at 90% and it would have taken a BIG leap to bridge. I settled and allowed myself to hold pace and glide in. I ended up rolling at at 39 mins 38 seconds, placing 3rd overall. I’ll happily take that! Scenery – 10 out of 10. Previous Article Lance Armstrong never existed. Next Article How do you define yourself? Congrats on your race!…..and leading the series after the first 2 races!! The park is a special place for sure, very nice to hear how much you love it as well. See you at another race soon I’m sure! Congrars on the race, Corey! And great report as well…you just might plant the seed of snowshoe racing in my head.